The youngest of three sons of Venezuelan parents — Caesar and the late Maria (Cordova) Valero, both born in Caracas — he has also influenced the development of Hispanic ministry in the Diocese since the mid-1970s. Born in the West Harlem section of Manhattan on Aug. 15, 1930, he attended St. Joseph’s School there and Sacred Heart Mission House, Girard, Pa., before beginning seminary training at Cathedral College, Brooklyn. He completed his preparation for the priesthood at Immaculate Conception Seminary in Huntington, L.I., and was ordained June 2, 1956, by Archbishop Thomas E. Molloy in St. James Cathedral, Brooklyn. His first assignment was to St. Michael–St. Edward’s parish in Fort Greene for a year, followed by three years at St. Agatha’s, Bay Ridge. In 1960 he began studies in social work at Fordham University School of Social Service, earning a master’s in 1962. For the next 12 years he served at Catholic Charities, first at the Family Service Office and then as Kings County director before becoming the first director for the Office for the Aging. From 1974 until 1980 he was coordinator of the diocesan Spanish Apostolate, during which he also served as chairman of the board for the Northeast Hispanic Pastoral Center. In June 1979, he was named the pastor of Blessed Sacrament Church, Jackson Heights. Late in 1980 Pope John Paul II appointed him, along with Msgr. Anthony J. Bevilacqua and Father Joseph M. Sullivan, an Auxiliary Bishop, the announcement made Oct. 7. He was given Vicar Turris as his Titular See. The Episcopal ordination for the three took place Nov. 24 in Our Lady of Perpetual Help, Bay Ridge. Bishop Francis J. Mugavero was the ordaining prelate, assisted by Auxiliary Bishop Charles R. Mulrooney and Bishop John J. Snyder of St. Augustine. 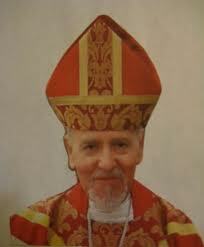 Bishop Valero remained as pastor of Blessed Sacrament after his Episcopal ordination, then in 1983 he was appointed by Bishop Mugavero to direct the Catholic Migration and Refugee Office, a position he held until 1991. Shortly after Bishop Thomas V. Daily became Brooklyn’s sixth bishop in 1990, he established the diocesan Committee on Racial Harmony and appointed Bishop Valero to chair it. Under his leadership, the committee has elevated consciousness on the evil effects of racism by sponsoring then-annual convocations featuring prominent speakers, conducting parish hearings and arranging discussions in parochial schools. In addition to his diocesan activities, he has served on several bishops’ committees. Retired Auxiliary Bishop Rene A. Valero, the Diocese of Brooklyn’s first bishop of Hispanic heritage, served as vicar for Elderly and Racial Concerns and Regional Bishop for the 56 parishes of the Queens North Vicariate.